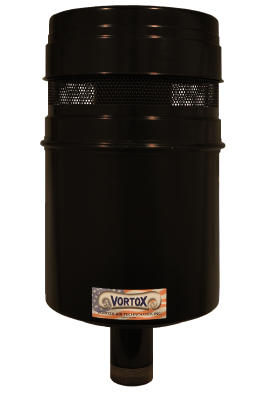 Vortox Air Technology, Inc.’s newest addition to our line of Truck Blower Air Cleaners offers the option of directly mounting the air cleaner to the blower with either 3” or 4” piping. Direct Mount air cleaners are pressure only use and made with Electro Galvanized Carbon Steel, which is finished in a black polyester powder coat. Included with each air cleaner are two (2) mounting brackets in the same finish. Additionally, a washable internal foam precleaner, which reduces blower noise, comes standard with each Vortox Air Technology Truck Blower Air Cleaner. Filter servicing is achieved in three easy steps: removing the band clamp, lifting the top off, and removing the filter element.